Now offering a wedding fitness plan alongside first wedding dance lessons with Personal Pilates Training! From as little as £35 when booking first wedding dance package you and your spouse-to-be can get wedding ready with lifetime fitness plans. among many other physical and emotional wellbeing health benefits. Couple sessions are cheaper than 1:1 fitness sessions and provide a great bonding opportunity. These sessions can keep going beyond your wedding – a fitness plan is for life! 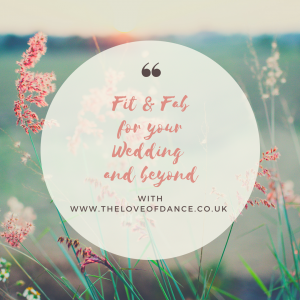 Read the blog on getting wedding fit!